Blood, Mouse Poop, Sewage – 3 Things You Should NOT Find in a Grocery Store - Dalton & Co. If you manage a grocery store, the story produced by the news team at Fox 59 in Indianapolis in early 2017 should send shivers down your spine. For a series called “Dirty Dining,” they reported on some pretty unappetizing health violations at a few area grocery stores. • rodent droppings on shelves, including where candy was sold. In summary, all kinds of gross. A big part of the problem was a lack of training among the staff. When questioned, deli workers were not aware of proper hand-washing procedures, proper temperatures for food storage or cleaning procedures for equipment. Here’s a checklist to help you plan your next staff training. 1. Deli and seafood counters are what customers worry the most about. Cross-contamination is the number one concern in areas where meat and fish are out in the open. Make sure your staff thoroughly understands the importance of cleaning cutting boards thoroughly after use and not reusing contaminated rags. Stress the importance of cleaning all equipment thoroughly, the same way, every day. 2. Walk-in coolers are too often not cleaned thoroughly. Posting a FIFO sign (“first in, first out”) in the walk-in refrigerators and freezers is a good reminder that stock rotation is an essential practice to prevent food expiration. Teach them the importance of removing everything from the shelves when they clean and putting it back exactly where it was so as not to disrupt the rotation. Ensure they keep food in solid containers to contain leakage and that they sweep and mop the walk-in floors daily. 3. What they find on floors can indicate bigger problems. Most employees understand the importance of sweeping and mopping the floors, but they should take a lesson from the “Dirty Dining” story and reach all the way under the shelves with the broom. It’s better to discover mouse droppings down there than to have a customer or health inspector find them among the candy … unless you think you can pass them off as Tic Tacs. 4. Restrooms might be out of sight, but they’re not that far away from the produce section. With all the attention on the areas where food is stored, grocery store employees can sometimes let restrooms go. It’s essential for your staff to understand that germs travel. It doesn’t only hurt the customer experience to have a dirty, stinky bathroom, but after they use it customers will go back into the store and touch food items. Restrooms are a health concern as much as any other area. One of the best investments a grocery store can make is hand sanitizer stations and signs encouraging staff and customers alike to use them. 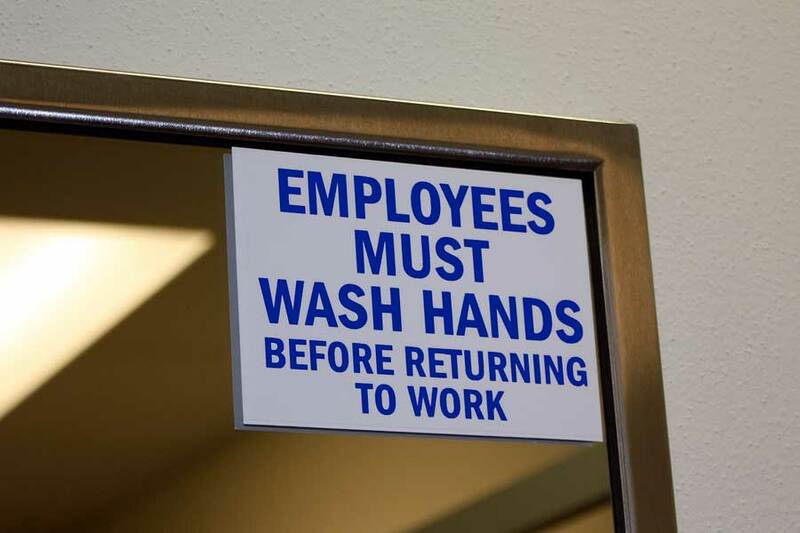 Signs like these encourage a culture of cleanliness that keeps your people thinking clean and reminds them of their duty to maintain a healthful environment. Of course, they’re going to need a lot more supplies than that to keep the health inspectors happy. We’re here to equip you with what your staff needs in their grocery store cleaning regimen. Reorder online today.